This Dinner Will Get You Thirsty This Thursday – This Girl Loves to Eat! We missed taco Tuesday this week. I was just too tired and sad from having to put my beloved lab to sleep Monday, to even think about cooking and getting my Mexican food fix. The household is slowly recovering so I ventured out to the grocery store and then into the kitchen to throw something together tonight, that wasn’t takeout. I came up with something tasty, filling and gluten free! I bought a nearly 6 pound whole young chicken and roasted it in a 375 degree oven for about 1 hour 45 minutes, took it out to rest and then removed the breasts and placed them in the Vitamix container. Strain the drippings into a measuring cup and add enough chicken broth to equal 1 1/2 Cups. In the same oven, while the chicken was cooking, I laid 6 strips of bacon on a cookie sheet and baked them for about 18 minutes, until they were crispy and browned but not yet burning. Remove the bacon from the oven to drain and cool then cut it into pieces and add to the Vitamix container. Once the chicken has finished cooking, increase the oven temperature to 400 degrees. Wash and dry the Pasilla peppers then carefully cut the top off of all four, discarding the stem and seeds. Take each of the peppers and cut a wide V shape on one side (from the top toward the solid bottom it’ll look like a V-neck shirt). Place all 4 peppers on a cookie sheet. Remove the stems and seeds from the bell peppers. Cut in half and then into quarters until all pieces can lay flat on a cookie sheet. Bake both sheets of peppers 20-25 minutes until the skins blister and start to blacken. Remove the bell peppers from pan to cutting board to cool and then cut into small pieces and add to the Vitamix container. Pulse the mixture until well combined. Move mixture to a mixing bowl, add 3/4 cup shredded cheese, the chopped green onion and the Arrabiata sauce stirring to combine. Fill each of the Pasilla peppers with the chicken mixture mounding each until they’re full. Sprinkle the rest of the cheese over each of the peppers and bake in the 400 degree oven until the cheese is melted and starts to brown. Rice: In a medium saucepan with a lid, combine the reserved drippings/chicken broth, 1 TBLS butter or olive oil, and 1 Cup Arborio rice. Cook over medium heat until it reaches a boil then put lid on, reduce heat to low and simmer for 20 minutes. Remove pan from heat and allow to steam for 10 more minutes then fluff rice with a fork. Sauce: While the rice is cooking, simmer the reserved pieces of Pasilla pepper with about 3/4 cup chicken broth until liquid reduces by half and peppers are fork tender. Move peppers and broth to the cleaned Vitamix container and process until only a few small pieces remain. Add 3/4 Cup sour cream to the Vitamix container and process until thoroughly combined and smooth. Add salt and pepper to taste. Serve: Place rice in the center of the plate, lay one stuffed pepper on top of the rice and drizzle the sauce over the pepper. 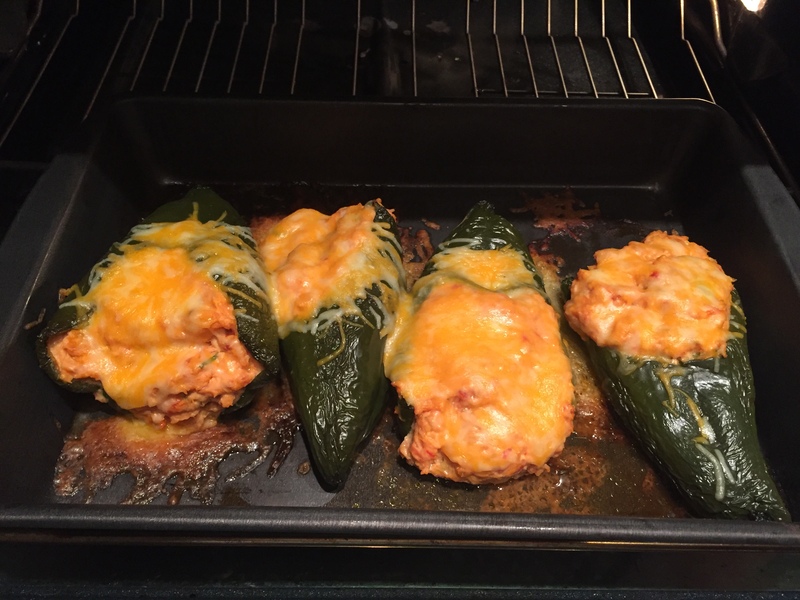 Posted on October 22, 2015 October 22, 2015 by ls1228Posted in Dinner, Menu, Recipes, Side DishesTagged bacon, bell pepper, chicken breast, chicken stuffed pasilla peppers with arborio rice, gluten free, pasilla, poblano, Taco Tuesday, takeout, Vitamix.